Arrive Hong Kong International Airport. On arrival, transfer to hotel. Hotel check-in is strictly by 14:00 hrs. After lunch, free time for relaxation or to explore Tsim Sha Tsui area on your own. 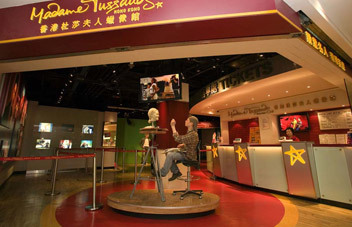 In the evening, proceed for Hong Kong City Tour which includes Madam Tussauds Museum, Victoria Peak with one way tram ride, from the platform called sky terrace 428, you can see the entire city in a nutshell. There is an observation deck also. The terrace 428 has a dining and retail shops. Later proceed to The Avenue of Stars pays tribute to the names that helped make Hong Kong the ‘Hollywood of the East.’ Overnight at hotel in Hong Kong. Breakfast at the hotel. Later proceed for exciting tour of Ocean Park which is one of the largest marine theater in the world. It is also an amusement park with an area of 870,000 square metersperched around two mountain peaks. Penguins, Dolphins, Sea lions, sharks and killer whales are housed in their natural environments. Also an excellent opportunity to see its two most popular guests – Jia Jia and giant pandas. The park offers several rides - the exhilarating Flying Swing, the thrilling Mine Train, Dragon Roller Coaster, the Eagle and the latest Abyss, Turbo Drop which guarantees you the utmost excitement by a sudden downward plunge from as high as a 20 storey building. Evening come back to hotel. Breakfast at the hotel. Later proceed for full day tour at DISNEYLAND. Here you can enjoy a lot of activities. Futuristic highway in autopia, water ride, theme parks besides eateries are main factors of the park. Evening return back to hotel. Overnight at hotel in Hong Kong. After breakfast, check out and proceed for the ferry terminal to Macau. On arrival at Macau complete the customes and immigrations formalities. Proceed to the hotel and check in (strictly by 14:00 hrs.). Rest of the day free for to explore. Free time for relaxation or to enjoy and explore this beautiful resort or you can try your luck at various casinos on your own. Overnight at hotel in Macau. After breakfast, proceed for City Tour of Macau which includes ruins of St. Paul’s regarded as the symbol of Macau, the surviving facade is actually the remaining front wall and majestic stairway of the sacred St. Paul’s church after the fire in 1835, which burnt the whole church into flames except the front wall, the most valuable part. A-ma temple the temple was dedicated to the seafarers’ goddess dates from the early 16th century and is distinguished by beautiful tiled roofs and spectacular views from the upper gardens. Senado square is paved with a wave patterned mosaic of colored stones. 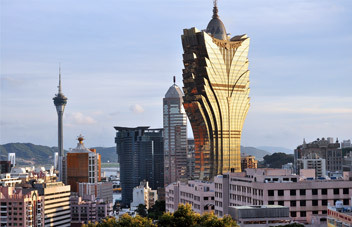 it is the heart of the city surrounded by varieties of shops making it a pedestrians’ and shoppers’ paradise standing at 338m, the MACAU TOWER is a convention & entertainment centre which includes shops, restaurants, a convention centre, a cinema, a theatre and an exhibition hall. Climbing up the Obseravtion Deck on 58th level for a breathtaking panoramic view and enjoy fresh air at a height of 233m above ground level. Later proceed for Delicious Pure Veg Gujarati Lunch. Free time for relaxation or to enjoy and explore this beautiful resort or you can try your luck at various casinos on your own. Later proceed for Delicious Pure Veg Gujarati Dinner. Overnight at hotel in Macau.